Progress 14P - Universe Galaxies And Stars Section. Progress 14P Docks With Station. 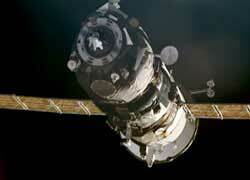 Russian cargo spacecraft docked: Image credit: NASA. A Russian cargo spacecraft successfully docked with the International Space Station on Thursday, bringing much needed supplies to the astronauts. On board the Progress 14P spacecraft are 2.5 metric tonnes (2.76 tons) of water, food, air, propellant, as well as scientific equipment. The ship also carries a Russian Orlan-M spacesuit, which will replace a malfunctioning US-built one. It will be needed when the astronauts make a spacewalk in June to fix a power control and circuit breaker box for one of the station's four gyroscopes. The Progress was launched Tuesday from the Baikonur Cosmodrome in Kazakhstan and chased the Station for two days, using its engine to conduct rendezvous maneuvers in fine-tuning its course for today’s docking. After leak checks are completed to insure a tight seal between Progress and Zvezda, Padalka will open up the ship’s hatch later today so he and Fincke can begin unloading its cargo Friday. Next week, Padalka and Fincke will turn their attention to preparations for a spacewalk no earlier than June 16, Moscow time, in Russian Orlan spacesuits out of the Pirs Docking Compartment to replace a power controller on the Station’s truss that failed April 21, resulting in the temporary loss of one of the four Control Moment Gyros (CMGs) that govern the orientation of the complex. On Wednesday, Fincke and Padalka took turns maneuvering the Station’s Canadarm2 robotic arm to a position along the S0 Truss for camera views of the spacewalk worksite and downlink television of the spacewalk tasks as they are conducted during the planned 4-½ hour excursion. The two crewmembers will begin checking out their Orlan spacesuits next Thursday and are expected to climb into the suits June 11 in a dress rehearsal of the suit up and a thorough checkout of the suit systems that will clear the way for the spacewalk.